Since its passing in June, 2014, much discussion has been around whether one would lose their Canadian citizenship (citizenship revocation) if they have another citizenship in the world and have a criminal conviction. In fact, this has been one of the new government’s election mandates to reconsider this particular portion of Citizenship Act (C-24). First of all, it is not just criminal conviction. The conduct must be considered treason, espionage, or conduct to against Canada in significant conflict situations, under the Canadian Criminal Code, Canada Defence Act, etc. Another situation is if one has a membership in a terrorist group or has organized criminal activities. 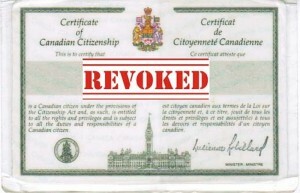 Second, ‎revocation of your Canadian citizenship cannot render someone a stateless person, in order to meet our international obligations. Here is the major discrepancy between how the ministry of citizenship and immigration and how the legal community “reads” this section under s. 22. The ministry is of the position that you may lose your Canadian citizenship if you already have a dual citizenship. The legal community is of the position that the section only states that: A person cannot be rendered a stateless person. So if you person “could” regain his or her citizenship by his parents (British for example) , then if that person gets caught in this section, this section would allow the minister to revoke his Canadian citizenship, even if he was born in Canada. At this point, all these positions are in theory because this section has not been before the courts. However, the very idea of taking Canadian citizenship from a person who may have been born in Canada does create a significant issue for all Canadians.